Halid took the 2012 $100,000 Transformation Challenge and hit the gym with extreme dedication. Follow his plan for great results! 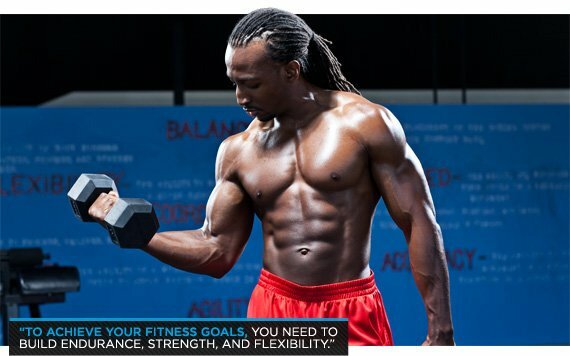 To achieve your fitness goals, you need to build endurance, strength, flexibility, and more. Halid built every aspect of fitness by starting slow, developing a champion's work ethic, and hitting the gym with everything he could muster. Halid's workout is not easy. It can't be done in 30 minutes. You won't get results like Halid unless you lift hard, rest well, and train every muscle in your body. It doesn't sound easy—because it isn't. My overall approach and philosophy to training are just the general guidelines for bodybuilding and weight training. I start most days with heavy compound lifts, like the bench press, squat, and deadlift. When I was younger, I would work out, but I wasn't as consistent, so I didn't get the results as quickly. Once I started going to the gym consistently (3-5 times per week), I started seeing results. Near the end of a regular heavy workout, I started doing lighter weight with higher repetitions, working different rep ranges for hypertrophy. To avoid injury, I listen to my body. If my hamstring tendon is bothering me, I skip hamstrings that day, save it for later in the week, or just leave it for a whole week. My splits get jumbled up, but you gotta listen to your body. You can't just keep working through the pain; you gotta be smart about it. I like to train my back; that's my favorite body part. I never used to train back, but when I started hitting it, I kept getting stronger. It's one of those muscle groups that you can't see while you're working out. I love pumping up my lats! I started with cardio twice per week, then three, and so on. I was doing cardio 4-5 times per week toward the last half of the contest. I also increased the duration of cardio. I aimed to burn 400-500 calories, or go for 45 minutes. I'd usually hit the calorie goal before time ran out. On rest days, that's all I did—rest. I didn't work out or anything. I used music to keep myself motivated on the days I didn't want to be there, or had a long day at work. I have some nice headphones with deep bass. I put on my jams and it gets me pumped. The music keeps me going. As long as I have my music and my MP3 player, I'm good. Lift the heaviest weight that still allows you to complete the rep goal for each set. Rest 2-3 minutes between regular sets. Increase weight as you decrease reps.